Folklife and Traditional Arts Dominates Houston! 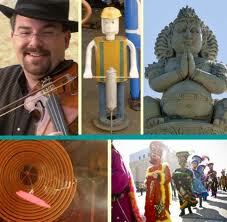 Welcome to Houston Arts Alliance’s Traditional Arts & Folk life launching. We are promoting and presenting lively cultural traditions and folk life. Our program’s goal is to to make the best include research, documentation and public projects that explore the wide variety of establishing and emerging cultural communities that come together in the greater Houston area. Traditional bearers, folk artists, are individuals who “bear” or carry the tradition of a group of people through their art, customs, and words. We’ve got a professional folklorist who is available for presentations, demonstrations, lectures, performances and workshops. Tradition is made through ways of doing things that are passed on from one generation to the next within families, communities and cultural groups of all types. We are here to help you to preserve your traditional arts and folklife within the centuries to come. So once again welcome! Go and find out what you want to improve your tradition and folk life. Hope you’ll enjoy what we offer for the best for you. Find out some more here!